As you well know, 16 is the worst hand you can be dealt. Your hopes of improving this hand by hitting are the weakest of any hand: 5/13 (38.5%). At first glance, your only hope is to pray for the dealer to bust. But then you look at your cards again and realize you have two 8s. Hitting 8-8 is a foolish choice. Because it is a 16, hitting will give you a return of -$0.41 to -$0.54 for each dollar you invest in the hand. There has to be a better option. You guessed it, splitting is the way to go. If you split when the dealer has a 2 through 7 exposed, the return is a positive $0.07 to $0.41. For the stronger 8 through A, the return is -$0.02 to -$0.48, still far less than your chances when you hit. 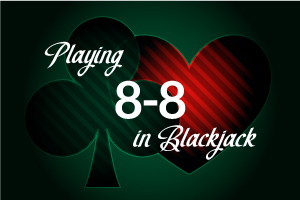 You will want to always split your 8s, regardless of what the dealer has.